We have found out that OneTwoTrade has shut down their operations. OneTwoTrade is one of the leading providers of binary options trading services for retail investors. With customers from around the world, a reputation for delivering high-quality support and extensive free learning services, the company stands out among binary option brokers. During our review of OneTwoTrade, we had a chance to use their trading platform as well as their ancillary services, including daily market updates and online trading seminars. The company offer a range of account tiers that cater to all budgets and experience levels. The company was founded in 2011 by a team of financial industry veterans. The pedigree of the management team shines through in day-to-day interactions with the support team, and OneTwoTrade excels at delivering a positive trading experience. With a powerful trading platform that is accessible via the web and dedicated mobile apps, it’s no wonder that it has emerged to become one of the leading brokers out there. OneTwoTrade provides its investors with access to more than 350 underlying assets. These assets include stocks, commodities, currency pairs and indices. This is one of the most extensive varieties of assets that we have come across, demonstrating that OneTwoTrade aspires to provide its clients with as many trading opportunities as possible. The company is generally able to provide its clients with a 100% bonus on first-time deposits, though from time-to-time they provide bonuses of up to 200%. This is on the very high-end of what’s on offer in the binary industry today. Additionally, the company runs a series of promotions that give traders the opportunity to be rewarded with additional funds by referring their friends to OneTwoTrade. The payouts on offer with OneTwoTrade are also on the high-end of what’s available, just lts. At the entry level, the company offers a Starter package that provides full access to all platform features, and additional services like trader education and markeike with Banc de Binary for example. Although the potential returns vary according to option type, it is not uncommon to see payouts of 85% for a single trade. By any measure this is a sizable payout for a trade that can be over and done with in the space of just a few minutes. The company provides an array of account tiers to suit investors of all experience levels and budget updates, for a minimum deposit of just $250. At the other end of the spectrum, the company offers what it calls the ‘VIP Diamond’ package. This account tier, which is only available to investors who deposit a minimum of $50,000, provides personalized one-on-one tutorials and a range of other VIP perks. OneTwoTrade also has a number of account types that serve traders who fall between the Starter and VIP Diamond account tiers. A new client is assigned to an account tier depending on the amount that he or she deposits into his or her trading account. OneTwoTrade is one of the more sophisticated brokers in terms of the variety of options that it enables its clients to trade. In addition to Classic Binary Options, the company accommodates the trading of Long-Term Options, Short-Term Options, One Touch Options, Ladder Options and Pairs Options. Coupled with its extensive asset offerings, these different option types provide OneTwoTrade’s clients with an extremely broad range of trading opportunities. OneTwoTrade enables its clients to make deposits in USD, GBP, EUR and YEN using a variety of payment methods. These payment methods include credit/debit cards, wire transfers, Neteller, Skrill as well as Bitcoin. OneTwoTrade was in fact the first regulated broker to introduce support for Bitcoin, which suggests that the company is committed to rolling out new payment methods as they become available. Withdrawing funds from a OneTwoTrade account is simple. Clients simply navigate to My Account > Account Settings > Make a Withdrawal in order to submit a withdrawal request. Withdrawals are typically processed within a few business days, and are paid to clients using the same payment method that the clients used when making a deposit. OneTwoTrade has a reputation for delivering a high-grade of customer service, and our experience with their support staff was very positive. They speak a number of languages, so you should be able to get support in your preferred language, and they are easy to contact at any time to discuss your questions, technical issues and other support matters. Overall, OneTwoTrade is a high-end, reliable broker that caters to all kinds of investors. Their platform and technology is robust and intuitive, their customer support is great and their range of underlying assets is, as far as we know, unmatched in the binary options industry. OneTwoTrade is definitely worth a closer look if you’re searching for a new binary options broker. They will take care of you no matter what your budget and experience level is. Read also Binary Option Robot review if you are looking for auto trading software or binary option signals. 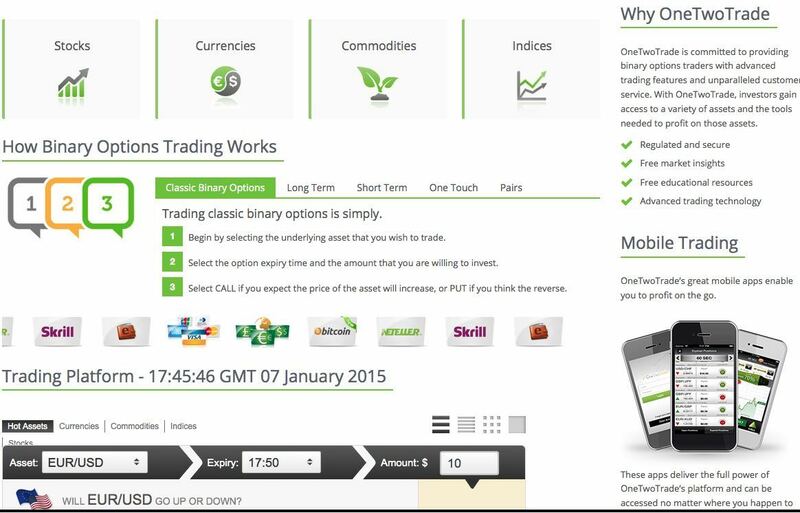 7 Binary Options review: OneTwoTrade: 4,5 stars.